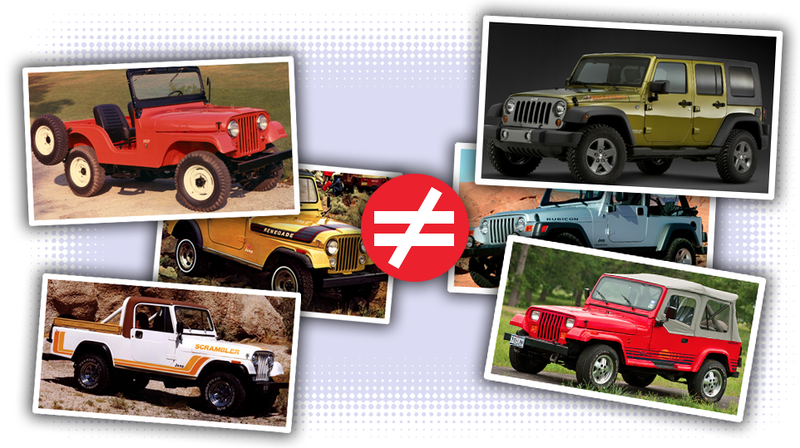 Everyone seems to be getting this bit of historical information wrong— including Jeep itself—and it’s time to just clear it up once and for all: a CJ is not a Wrangler. There is no such thing as a 1966 Jeep Wrangler CJ. In fact, there was never a Wrangler at any point before 1987 unless you’re talking about jeans, Goodyear tires, or trim packages on Canadian-market Chevy and GMC trucks. It’s a 1987 (called the YJ in the Canadian market because of the conflict with Chevy/GMC), and that badge on the driver’s side rear quarter panel is the first time this world ever saw the word “Wrangler” on a Jeep. Any evolution of the original 1946 Civilian “Universal Jeep” built before 1987 was a CJ, and any after model-year 1986 is called a Wrangler (except in Canada and a few other markets). It’s that simple. That’s it; there have only been three generations of Wrangler: YJ, TJ (which had a long-wheelbase model that many call the “LJ”) and JK (in two and four-door guise). I’m not sure why Jeep keeps calling the old CJs “Wranglers.” Are they doing it intentionally so people connect those badass old Universal Jeeps of yore to the modern product that you can pick up today at your local friendly Jeep dealer? Who knows. Either way, I’m here to make sure none of our fine readers ever make this error. And if they do, they’d better not make it in my presence, or god help them.